After the wedding, I slept like a log and woke up feeling hungry. Lindsay turned up with croissants at midday and after a cup of tea we all decided to have lunch at the Victoria (again). 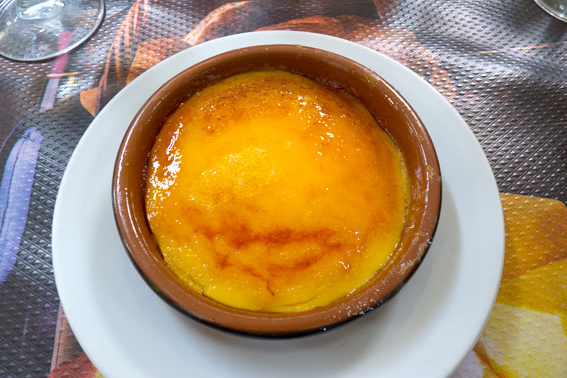 I enjoyed a particularly good fideuà and crema catalana. While we were savouring carajillos, I remembered that the Mercat de Mercats (Market of Markets) was on. Like the Christmas Market, the Mercat de Mercats is held in Plaça de la Cathedral. This is an annual event showcasing local food and drink from market stall holders, shops, restaurants and wine producers. I kicked myself, because we should have come here for lunch! I was feeling a bit sleepy after the Victoria, but nevertheless, as it was the last day of the three day event, I pulled myself together and got on with the job at hand. I have to confess that I skipped the wines after drinking half a bottle for lunch and on reaching the food section I hesitated for just a second …before being overwhelmed and delighted by the quality of the produce. Horno Santo Christo surprised me somewhat, since as well a baked goods, it had a well stocked fridge of boquerones, olives, salmon, etc. platos combinados (left) and the ever popular pulpo a la feira (boiled octopus with pimentón). and quails eggs with botifara or chorizo. sell a wide array of exotic fruits, vegetables, condiments and sauces. Here they also had arancini, croquetas, pizza, sandwiches and wraps. nuts and candies, reminiscent of Fortnum and Mason in London. and arròs negre (black rice with squid ink). to make a high quality extra virgin olive oil (which smells of green fruit, freshly cut grass and ripe banana). Apparently they keep a herd of sheep to control the weeds! Gori Embotits de la Vall d’en Bas are artisans curing meat and sausages in beautiful valley near Girona (Vall d’en Bas). and I love these astonishingly long secallona. Formatges Montbrú make a number of cheeses from cows, goats, sheep and buffalo. I noticed that they had a sign stating zero lactose and when I looked it up, discovered that buffalo milk is virtually lactose free. Regardless, the cheese is very tasty! The cheese is made in Moià (home to prehistoric caves) and about 31 miles from Barcelona. Valliser are a food company in the Penedès, dedicated to producing artisanal quince. The quince is a member of the Rosacae family (which also contains apples and pears). It originally came for the Eastern Mediterranean, but has spread throughout Europe and was once far more popular in Britain than it is today. The quince can be used to produce a wine or strong liquor, though the most popular culinary products are quince jelly, jam and pudding. In Spain it is very often eaten with cheese (Manchego), in a bocadillo (sandwich) or as part of a cheese platter. The hardened jelly is sometimes referred to as quince cheese. Espai La Cava are located quite close to La Sagrada Família and specialise in hams, cured meats and cheeses. Their sobrassada (a soft, spreadable, cured pork sausage flavoured with pimentón), traditionally from the Balearic Islands was particularly good. Hortet del Baix was started by two farming families, who have gone into organic fruit and vegetable box delivery, similar to companies doing this in the UK. Arrossaires del Delta de l’Ebre are a rice growing cooperative on the Ebro Delta in the Province of Tarragona. The Arrossaires grow Bomba rice (above), which is the best known variety cooked on the East Coast of Spain. Bomba rice is very popular for dishes such as paella, Arròs Negre and Arròs a Banda. Bomba is thought to have been brought to Spain by the Moors and is believed to have originated from an Indian strain. While looking at the Arrossaires’ stall, I noticed that they have diversified into making liqueurs from rice, flavouring them with cream, figs and herbs. They are also the first people to produce a rice malt beer – good news for people allergic to gluten. Embotits Artesans l’Esquiador from Girona, produce artisanal cured sausages and meats. Their cured pork belly was excellent. They day had started out slightly chilly, from the rain yesterday, but this afternoon the sun shone brightly and it became quite hot and humid. I was very grateful to Sanpellegrino, who handed out free citrus flavoured water. It was so hot that I went back for a second can! The Valle de Arán (Aran Valley) is the only part of Cataluña on the north side of the Pyrenees. The stall pictured above showcased their produce, including caviar, casis, cider, hazlenuts, jam, mustard and paté. meat and cheeses from traditional regional fairs and markets. This blau d’osona cows milk cheese (top left) had a real kick. It reminded me of Asturian cabrales cheese, which I’m very fond of. Mel Muria Bio has produced award winning honey for 6 generations – they now have over 2,000 hives and sell their products throughout Cataluña and Spain. Sushi Catala Xarcuteria is Olga Rovira’s unique Catalan take on the Japanese dish. Olga believes that her sushi ingredients should be fresh, local and economical. It’s worth noting that there’s quite a bit of Catalan Japanese fusion going on in top Barcelona restaurants. I find this unsurprising since seafood is such a large part of the Spanish diet. In fact, Tempura originally came from Iberia via Christian missionaries – the Japanese just refined it and they have been coming to Spain to buy the very best tuna for many years. Formatges Vall de Catí – cheeses from the Vall de Catí – a valley in the north of Valencia. They produce some excellent award winning organic cheese from goat and sheep milk. I was encouraged to try all their cheeses and liked the hard ovella (sheep cheese above) so much that I bought a piece. O’Croquet, AKA Oliver Croquet, makes one of my favourite Spanish foods, the croqueta. The above bacallà croquetas (salt cod), had a perfect crunch, with the right mix of creamy cod filling – to die for! Righetti Forners – Pa i Coca de Forner. This looks like fantastic bread and coca, from the town of Gavà, just west of Barcelona El Prat Airport. Embotits Can Gaburra are another cured meat and sausage company, from Olot. Their longaniza, xorizo and fuet (cured sausages) tasted so good that I had to buy some. but were not nearly as good as this bull blanc (a bladder or intestine stuffed with pork mince and seasoning). I was quite interested in buying one of these, but they tried to push the more expensive lomo (cured pork tenderloin) on me instead, so I moved on. Quesos Ojos del Guadiana come from Cuidad Real, so they were a long way from home. They make a first class Manchego, which they say is the “Best sheep cheese in the world.” It could definitely be one of them! This beautiful piece of beef is from Barrachina Meat & Burguer (their spelling of burger on the stall) – a shop and restaurant next to the Boqueria. I’m quite sure this wasn’t minced up and served in a bun. Carnisseria Gallifa have a stall in the Mercat de Felip II in the north of Barcelona. I was impressed with their brightly coloured seasoned meats (above) and I believe they are big on barbecue. Symposion Especialitats Gregues specialise in Greek produce and have a stall in the Boqueria. Back in the 90s one couldn’t find taramasalata for love nor money in Barcelona, which I considered odd, because of the Catalan love for cod and the popularity of tarama in France, just next door. I was a little surprised to see them selling empanadas, but I realised that they contained Greek style fillings. and little rolls containing tuna or anchovies for €2. Large cups of olives also cost €1. I was very keen to try their black truffle potato chips (crisps) too! These are available from their stall in the Boqueria. The oysters at La Belle Huitre were in a glass fridge reflecting the sun, but I did get a decent shot of their pop (octopus) on skewers above. More olives here from Olives i conserves Torres, who are in Sant Antoni Market. and here, anchovies with pimiento. Even the little olives stuffed with salmon and cream cheese looked delicious. with their foie gras, cassoulet and confit de canard. It is said that Jews fleeing from the Inquisition took the white beans in cassoulet to France from Spain. Most beans, aside from native broad beans, came from the Americas and would have come through Spain before reaching the rest of Europe. Cassoulet itself may be derived from the Jewish Cholent. Yet more olives from Olives i conserves El Pinyol. and some fantastic brandada in cones. After all the shopping and tasting, I was exhausted. I didn’t even get to the restaurant demonstration section as I was badly in need of a siesta. …later on, awake and refreshed, I cycled across the square at around 11.30pm and found that the market had completely disappeared! 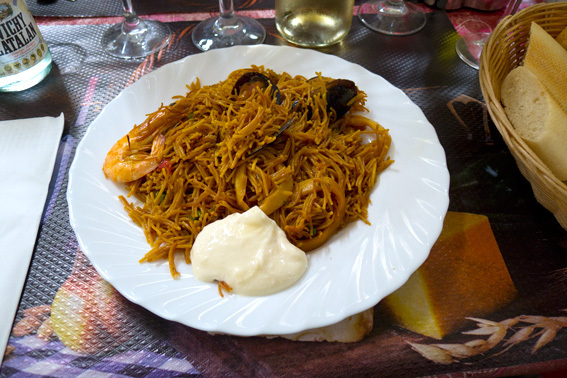 This entry was posted in Barcelona, Drink, Eating Out, Fish, Food, Meat, Shopping, Spanish and tagged Arrossaires del Delta de l'Ebre, Baron de Roquette Buisson, Barrachina Meat & Burger, Cansaladeria La Confiança, Carnisseria Gallifa, Catalan Markets, El Pinyol, Embotits Artesans l'Esquiador, Embotits Can Gaburra, Espai La Cava, Fires i Mercats, Formatges Montbrú, Formatges Vall de Catí, Gori Embotits de la Vall d'en Bas, Horno Sto Christo, Hortet del Baix, La Belle Huitre, La Cabana d'Alcover, La Cuina Internacional Soley, Mariscos Selectos Juani, Mel Muria Bio, Mercat de Mercats, Molt Bó, O'Croquet, Olives Francesc de la Boqueria, Olives i conserves El Pinyol, Olives i conserves Torres, Quesos Ojos del Guadiana, Righetti Forners, Sanpellegrino, Sushi Catala Xarcuteria Olga Rovira, Symposion Especialitats Gregues, Valle de Arán, Valliser, Vidal Pons. Bookmark the permalink. Oh sugar: we all would pay for the bikes and the resultant photos!!! Hmmm: rather naturally I DID think of my very favourite mercats [I mean those gorgeous curious little animals] ere the wonderfully long ‘lesson’ began but have just had the bestest walk-around-market experience of probably my lifetime!! . . . And my biggest lesson of the day: my High School class was well over 50% Jewish and ‘cholent’ is not exactly a strange appellative for me: actually one of my fave ‘ladies’ lunch meals 🙂 ! OK: ‘skiting’ – remember SO many places selling taramasalata in Sydney in the 60’s – hell, I made my own 🙂 !! Still do!!!! Thanks Eha – it was quite a day! I have read that baked beans may also be related to Cholent, where some Jews fled the Inquisition and went to America, taking the white beans full circle. These types of dishe are all cooked slowly overnight, which is what is required when observing the Sabbath and not cooking or working. Oops’a’daisy: methinks the roe I have always used just may not be prepared in the ‘correct’ way!! Melbourne: still the best food in Oz and one of the largest Greek and Italian populations in their respective diasporas. These days ‘taramasalata’ naturally is offered in every so-called ‘dip’ etc el anon . . . . . yucksville . . . .oh, DO love your ‘walk’!! I think you are probably preparing the roe correctly – the Greeks like it soft and dipable, whereas the Spanish cure it, a bit like air dried ham. I loved Melbourne, it was one of my favorite cities in Australia. Ha ha – it was a fabulous dream! JEALOUS!! And those bacallà croquetas sure do look good. Thanks Michelle – you know how much I love good croquetas! Plus, I forgot to say: the name of the market alone is delightful! Wow! This looks like the most amazing market I have ever seen. I would be in heaven. It is just a once a year event? Thanks Nadia, yes it’s an annual event. Currently there’s a Christmas market in the plaça. Well, those are fun too but that food market looked amazing! Hi James – it was spectacular! There are a lot of other markets in Barcelona including a fantastic flea market and Sant Antoni is due to move back into it’s fabulous Victorian era building in the next year or so, after an extensive renovation. Wow what a display of abundance! Thanks for taking us through the market with you. Those sausages and paellas and seafood!!! Very interesting amit the cassoulet coming from cholent. I never thought about that. Kind of cool. I could see how a market like this would be exhausting. Too much wonderfulness. Be well! That means you partied well! I most certainly did, but no resaca! Oh am swooning in a very old fashioned way at all the delights you have shared with us. Big Man was very taken with the beef like Celia and they do say that the best Spanish beef comes from Asturias . I salute your stamina. Am off to a local fishmonger tomorrow bright and early as today he announced that he has some salt cod for sale and I’d like to try to make Brandada for Christmas! You would think that the best would be from Asturias, since it is milk country, but in London Galician beef is all the rage. However, I think that the type of meat being used is from all over the north west and oddly it’s from old cows and the meat has been well aged. I suspect it’s all down to well worked muscles and slow cooking. Like cheeks or shin. Good luck with the bacalao – brandada for Christmas sounds fantastic! I think she’d be up for it! Wonderful post, MD! I would have been very upset with myself if I had missed this event. I’d probably fast a couple days beforehand so that I could take full advantage. Heck! I’d need a chair just to take full advantage of the place where the anchovies & olives and eel & olives were being sold.